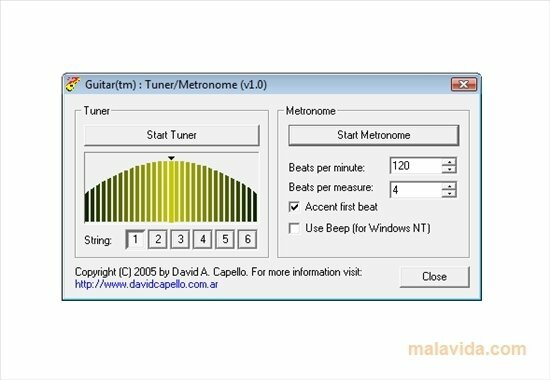 Two elements that are essential to any guitarist, as well as his guitar, are the metronome, thanks to which he can follow the rhythm and play following the tempo, and a tuner, thanks to which he can keep his instrument in tone. You can find these two elements in GuitarTM, a practical utility that integrates in a same interface, that is very simple and intuitive, a simple metronome and chromatic tuner. The metronome has options to modify the tempo and the cadence, so that we aren't limited to 4/4 rhythms. It also includes an options to stress the first step of the beat or so that it is the computers internal speaker that plays it. In what regards to the tuner, it has an adjustment per string, something that will be very useful for those guitarists that are used to digital tuners, so that we won't have to indicate each time what note each string corresponds to. 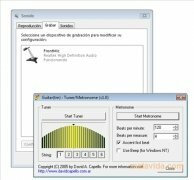 If you like to play the guitar and you are looking for a solution to have it tuned at all times and to be able to practice with a metronome, download GuitarTM.